After the brutal attack on Bryan Hartnell and Cecelia Shepard at Lake Berryessa on September 27th 1969, the perpetrator left his calling card on the car door of Bryan Hartnell's Karmann Ghia, as a form of confession to his crimes, listing the Lake Herman Road double murder of Betty Lou Jensen and David Faraday on December 20th 1968, the Blue Rock Springs Attack on Michael Mageau and Darlene Ferrin on July 4th 1969 and the latest attack, that ended the life of Cecelia Shepard. Forty two days later he mailed the now infamous Dripping Pen Card, containing the still unsolved 340 Cipher. Inside he wrote some key words "I get awfully lonely when I am ignored, so lonely I could do my thing", placing reference to several months, December, July, August, September and October at the bottom of the correspondence, finishing with the number 7, presumably his murders so far, as opposed to his victims. These months are apparently fixed chronologically, indicating his crimes, we assume under the umbrella of Zodiac. This was the only time during his five year campaign of letter writing that he was so detailed in his victim count, contented usually with just a number total. Four of the months can be attributed to his well documented Zodiac crimes, which seemingly leaves two murders in August unaccounted for. More puzzling, is that if he was claiming two victims in August, why did he clearly omit this from the car door, after the Lake Berryessa Attack the following month in September. In an interview with Bryan Hartnell, he recalled the killer's claim "I'm on my way to Mexico, I escaped from Deer Lodge Prison in Montana, Deer Lodge. I need some money to get there", followed by "I killed a couple of guards getting out of prison. And I'm not afraid to kill again". But he fails to place these murders on the car door, suggesting they were a necessity in his prison escape and not part of his Zodiac manifesto, or they were a complete fabrication to intimidate the young couple into compliance. The fact that these two guards have never been identified to this day, clearly indicates the latter. The two murders in August, if we take the Zodiac Killer at his word on the Dripping Pen Card, may have subsequently been attributed to another murderer or murderers. 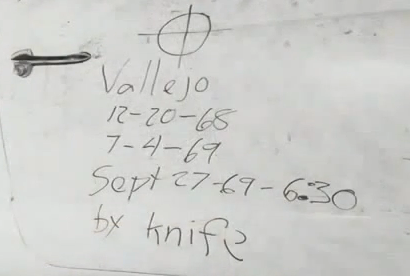 It is often believed, the Zodiac Killer may have associated himself with other crimes he had no part in, such as the Modesto Abduction of Kathleen Johns, the Richard Radetich murder and the Donna Lass disappearance, as well as his ever increasing body count total in later letters, without substantiation. As an example, the Zodiac Killer may have read about the murders of Leo and Rosemary LaBianca at 3301 Waverley Drive on August 10th 1969, crimes later attributed to the Manson Family and forever being the egotist, Zodiac placed August in his timeline on the Dripping Pen Card, to suggest an involvement in this crime. When we add up the murders widely attributed to the Zodiac on the Dripping Pen Card, we have 2 from Lake Herman Road, 1 from Blue Rock Springs, 1 from Lake Berryessa and finally 1 from Presidio Heights, totaling 5. This leaves 2 unaccounted for and the month of August. One would consider it now logical to look for either a double murder or two individual murders in August, but this is a false premise. There may have been one murder in August and six in total from December, July, September and October, not five as previously assumed. So looking for two missing victims in August may well be a crucial mistake, having been orchestrated down this path, by the very deliberate way the Zodiac Killer designed his Dripping Pen Card, realizing this to be the most obvious route the observer by elimination would take. The misdirection he put in place and the one he knew we would select. It could be said that he laid claim to the Lake Herman Road Murders, the Blue Rock Springs Attack, the Lake Beryessa Attack (due to the writing on the car door), and the Presidio Heights murder, but never mentioned any other crime in either of these months, therefore he never committed any. But if we are to believe his victim counts and the 37+ murders in the Exorcist Letter on January 29th 1974, he clearly has omitted many. What it means, is that this man was a master of selection, who lead us down a path of his choosing. His proclamation in the 'Bus Bomb' letter on November 9th 1969 of "I shall no longer announce to anyone. When I committ my murders, they shall look like routine robberies, killings of anger, + a few fake accidents, etc" would forever ring true, in that he never again directly implicated himself to a specific murder, only inferred in general terms. The Modesto abduction of Kathleen Johns on March 22nd 1970 was a crime he would eventually claim, however this was not a murder, so didn't fall under the 'Bus Bomb' letter proclamation. ​Let us examine the claim of seven murders on the Dripping Pen Card once more, comparing it to the Bus Bomb Letter, mailed just one day later. At the foot of this correspondence he gave us a diagram of a crosshair, with five X's on its circumference. If the Zodiac crosshairs on the left are placed over a map (see below), with the center of the circle placed over Mount Diablo and rotated, we find that despite its crude manufacture, that three of the X's can be drawn through from the center point to align approximately with his first crimes in Benicia and Vallejo, as well as the Presidio Heights murder of Paul Stine and the Lake Berryessa attack. If this was the reason for its design, then by elimination we are left with two X's unaccounted for. This would suggest that the 6th and 7th victims he claimed in the Dripping Pen Card were in fact true, however not a double murder at all, but two individual crimes. If we return to the commonly held assumption, that we are looking for two murders in August, taking the Bus Bomb overlay at face value, then all we have to do is follow the two lines on the right of the diagram below and search for similar murders in August 1969 at locations where each line passes over, or in close proximity to, that have the hallmarks of the Zodiac Killer. But be warned, if you believe the Zodiac Killer "you deserve to have holes in your heads."